E2E Networks Review 2019: Is E2E Networks a Good Hosting? For large businesses or organizations who need top-end resources to serve a sizeable Indian market, E2E Networks fulfills those needs. However, anyone can take advantage of their cutting-edge infrastructure at affordable prices. E2E Networks opened its doors in 2009 and has consistently been one of India’s leading cloud infrastructure providers ever since. 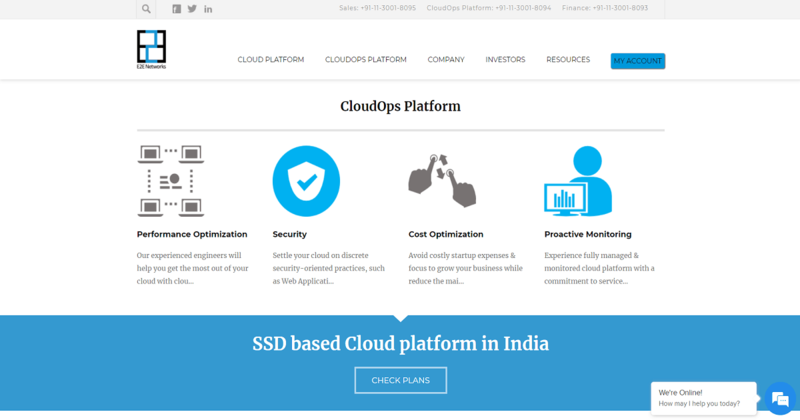 They now offer a wide spectrum of products for just about any enterprise-level cloud computing/hosting needs in India. One of their chief markets is internet startups, and as such, they tend to offer decently-priced packages for what they provide. As far as ease of use goes, it’s a little hard to make sense of their pricing plans at first. We recommend getting in touch with their sales team to talk you through it. However, once you have a plan in mind, the registration process is straightforward. Most platforms provide you with a ready-to-go server. However, as this is an advanced service you should have an IT team to handle it, or go with one of their dedicated managed products. E2ENetworks’ pricing plans are a bit hard to follow, so we’ll try and make it as simple as possible. Under their cloud platform packages, you have two broad categories: Private and Public Cloud hosting. Dedicated Compute Nodes: These are powered by high-end hardware for businesses where performance is critical. There are four sub-plans, each with an increasing amount of resources. Dedicated Load Balancers: These are a powerful shared hosting option with varying dedicated hardware. Backup and recovery services are charged as an extra service you can subscribe to. They also provide other services such as managed cloud computing packages, Varnish Cache, accelerators, and so on, as well as a long list of on-demand computing resources. Most of their solutions can be bought for a monthly or hourly rate. As these are high-level servers, you can expect to pay high-end prices. As a service that caters to enterprise and big business customers who demand performance, reliability, and the speedy resolution of issues, E2E Networks do provide highly skilled technicians to solve issues. So far, their staff has not been the friendliest, but they are obviously very competent and seem dedicated to getting your network up and running as soon as possible. However, be aware that support isn’t included with all products, e.g. the dedicated compute nodes. Although they provide cloud services all over the world, you’re still best off using E2E Networks if you need low latencies and powerful cloud-based infrastructure to serve an Indian market. You can pick and choose from a wide variety of plans with flexible hourly rates to fulfill your exact needs. Wondering how E2E Networks stacks up against other Web Hosting companies? Enter any other Web Hosting company and we will give you a side-by-side comparison.